Emerging medical research and persistent scientific investigation has allowed for fatalities from cancer, HIV, and cardiovascular disease to decline in the past ten decades. However, what about the disorders that affect one’s mental health? Unfortunately, mortality from mental illness has been accelerating. About 1 in 3 adults in the world are affected by mental illness. Despite a prevalent stigma surrounding these disorders, they directly disrupt the brain’s mechanisms. The difficulty in studying and treating brain disorders comes from its lack of evidence at the cerebral level. Unlike Alzheimer’s and Parkinson’s disease where the damage can be physically seen with a brain scan, mental disorders (such as depression, anxiety, PTSD, OCD, split personality disorder, and schizophrenia) are not discernible under the same scan. This is because mental illnesses involve shortcomings in communication within the brain, rather than deconstruction of the organ itself. Think of communication in the brain as similar to two people who are unable to talk on the phone. Rather than the miscommunication involving the complication of a broken phone (which could be seen visually), the complexities of mental illness can be compared to the two people speaking different languages neither one understands. The work of neuroscientists is instrumental in researching and executing plans to treat the complicated disorders of the brain. For example, schizophrenia attacks cognitive skills like motor skills and memory, making daily tasks difficult for those diagnosed even when their psychosis is treated. New understandings about this cognitive impact encouraged the FDA to allow medication that is directed at cognition rather than at solely psychiatric issues, improving the work and home life of schizophrenics. In addition, a bridge is being built between the work of neuroscientists and clinical psychologists. 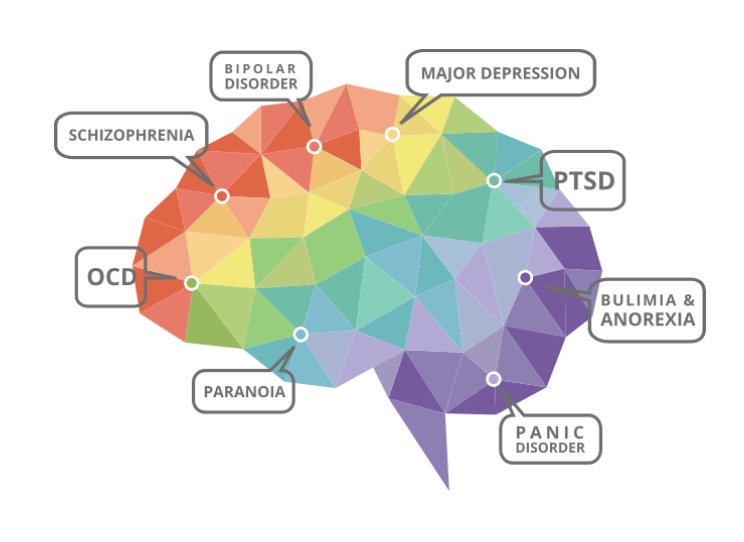 The interdisciplinary name of “mental health science” is used to describe those who yearn to provide a link between the scientific and emotional aspects of the mind. By further researching the changes that occur in the brain as a result of psychotherapy, insight can be obtained on the most effective type of therapy. The effort of neuroscientists has uncovered the value of exposure therapy on the brain of those suffering from certain anxiety disorders and phobias. Exposure therapy is essentially having the patient face their fears head-on. Continual work, similar to the therapy described, is being done to interweave the knowledge of neuroscientists and counselors. Over the past couple of decades, neuroscience has achieved wonders in the realm of knowledge expansion. However, application of this new knowledge to mental health treatment has not been as progressive. For example, it is known that depressed individuals have distorted metabolism and blood flow in the brain. Directing this knowledge to the treatment of these individuals is where it gets tricky. The highly subjective and personal experiences that come from brain disorders are a result of not only the complexity of consciousness, but the many layers that compose the human mind. That is not to say there is no hope. I see that we are at the threshold of something incredible, involving the accumulation of knowledge and application to the lives of those suffering. The world can be very different in several years, characterized by the societal removal of stigma surrounding mental health, a decline in suicide rates, and a global effort to provide greater access to treatment. Perhaps studying the brain is the greatest form of empathy. As we come to understand the mind of another, we get a glimpse into not only their struggles and hardships, but the beauty of their human experience.